The Film Independent Spirit Awards (abbreviated "Spirit Awards" and originally known as the FINDIE or Friends of Independents Awards), founded in 1984, are awards dedicated to independent filmmakers. Winners were typically presented with acrylic glass pyramids containing suspended shoestrings representing the bare budgets of independent films. Since 2006, winners have received a metal trophy depicting a bird with its wings spread sitting atop of a pole with the shoestrings from the previous design wrapped around the pole. In 1986, the event was renamed the Independent Spirit Awards. Now called the Film Independent Spirit Awards, the show is produced by Film Independent, a non-profit arts organization that also produces the Los Angeles Film Festival and whose mission is to champion creative independence in visual storytelling and support a community of artists who embody diversity, innovation and uniqueness of vision. Film Independent Members vote to determine the winners of the Spirit Awards. The awards show is held inside a tent in a parking lot at the beach in Santa Monica, California, usually on the day before the Academy Awards (since 1999; originally the Saturday before). The show is broadcast live on the IFC network, as well as Hollywood Suite in Canada and A&E Latin America. The 32nd Independent Spirit Awards, produced by Film Independent, a nonprofit arts organization, was hosted by Nick Kroll and John Mulaney, and broadcast live on IFC on Saturday, February 25, 2017 at 2:00 pm PT. Online streaming service Sundance Now live-streamed the Spirit Awards concurrently with the telecast, with an on-demand version available on Sundance Now. The Independent Features Project/West was founded by Gregory Nava and Anna Thomas. In 1984 the FINDIE Awards (Friends of Independents) were conceived by Independent Features Project/West board member Jeanne Lucas and Independent Features Project/West President Anne Kimmel and director/writer Sam O'Brien was an event producer. The awards are voted on by a nominating committee. In 1985, Peter Coyote and Jamie Lee Curtis presented winners with a Plexiglas pyramid designed by Carol Bosselman, which contain a suspended shoestring, printed with sprocket holes, representing the shoestring budgets of independent films. The Reel Gold Award, also designed by Bosselman, was given to Steve Wachtel for allowing Independent Features Project/West continuing free use of his screening room. It was associated with Filmex. 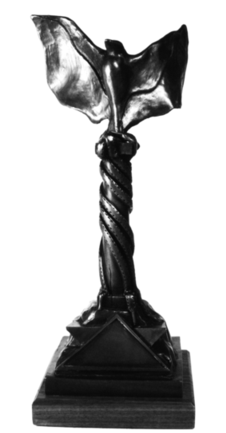 In 1986, Bosselman designed and sculpted the Independent Spirit Award statue that is still given out today, using a lost wax bronze casting method. Independent Features Project/West eventually became Film Independent. Dawn Hudson was director of Independent Features Project/West in 1995. Barbara Boyle was Independent Features Project/West president from 1994 to 1999. Independent Features Project eventually became Independent Filmmaker Project. In 2018 the Independent Spirit Awards first gave out the Bonnie Award, named after Bonnie Tiburzi, which "recognizes a mid-career female director with a $50,000 unrestricted grant sponsored by American Airlines." Chloé Zhao was the first to receive this award. ^ "Film Independent". filmindependent.org. Retrieved June 12, 2017. ^ "History - Film Independent". Filmindependent.org. Retrieved October 17, 2017. ^ a b Collins, Keith (February 25, 2005). "Independence days". variety.com. Retrieved June 12, 2017. ^ Film Independent Spirit Awards, IFC, archived from the original on May 22, 2011, retrieved September 28, 2011 . Citation supporting televised on IFC in 2011. ^ "A&E Latinoamérica". mx.canalaetv.com. Retrieved June 12, 2017. ^ "2017 FILM INDEPENDENT SPIRIT AWARDS PRESENTERS ANNOUNCED - Film Independent Press Center". Filmindependent.org. Archived from the original on March 31, 2017. Retrieved June 11, 2017. ^ "Sundance Now to Exclusively Stream the 32nd Film Independent Spirit Awards". sundance.tv. Retrieved June 11, 2017. ^ "Familiar names top Indie awards - Roger Ebert's Journal". Rogerebert.com. Retrieved June 12, 2017. ^ Page, Anna Thomas Tribute (August 10, 2009). "A Tribute to Anna Thomas: Biography for Anna Thomas". annathomastribute.blogspot.com. Retrieved June 12, 2017. ^ a b FOX, DAVID J. (March 27, 1992). "The Little Award Show That Could : Film: Since it started in the '80s, the Independent Spirit Awards, sort of an offbeat Oscar, has gained big-name supporters. Saturday's ceremony is sold out". Los Angeles Times. Retrieved June 12, 2017. ^ FOX, DAVID J. (March 30, 1992). "'Rose' and 'Idaho' Get the Spirit : Movies: Each takes three trophies in the offbeat independent counterpoint to tonight's Academy Awards". Los Angeles Times. Retrieved June 12, 2017. ^ "The Oscars Upstaged (Almost)". The New York Times. March 19, 1995. Retrieved June 12, 2017. ^ "Producer Barbara Boyle to Head UCLA Department of Film, Television and Digital Media". Businesswire.com. Retrieved June 12, 2017. ^ a b Independent, Film. "2018 Film Independent Spirit Awards Winners Announced". www.prnewswire.com. Film Independent (February 25, 2017). "The 32nd 2017 Film Independent Spirit Awards - Playlist". YouTube. Retrieved June 11, 2017. Film Independent. "The 31st 2016 Film Independent Spirit Awards - Playlist". YouTube. Retrieved June 12, 2017. Film Independent. "30th 2015 Film Independent Spirit Awards HIGHLIGHTS - Playlist". YouTube. Retrieved June 12, 2017. Film Independent. "The 29th 2014 Film Independent Spirit Awards - Playlist". YouTube. Retrieved June 12, 2017. Film Independent. "The 28th 2013 Spirit Awards - Playlist". YouTube. Retrieved June 12, 2017. Film Independent. "The 2011 Film Independent Spirit Awards - Playlist". YouTube. Retrieved June 12, 2017. Film Independent. "The 2011 Film Independent Spirit Awards Show - Playlist". YouTube. Retrieved June 12, 2017. Film Independent. "25th Film Independent Spirit Awards - Playlist". YouTube. Retrieved June 12, 2017. Film Independent. "2012 Film Independent Spirit Awards - Playlist". YouTube. Retrieved June 12, 2017. Film Independent. "The Best of the 25th Spirit Awards - Playlist". YouTube. Retrieved June 12, 2017. Film Independent. "Spirit Awards 2009 - Playlist". YouTube. Retrieved June 12, 2017.